MR. HEALY: It’s not envisaged that a lengthy Opening Statement would be made in view of the fact that there are only two witnesses, but, at the same time, so as to put in context to some extent the evidence to be given by these witnesses, a brief statement may be of assistance. It will be recalled that in the course of its inquiries, the Tribunal formed the view that the opinion of Mr. Richard Nesbitt did not address the question of changes in the makeup of the Esat Digifone consortium, and as a result, the opinion was to all intents and purposes of limited significance. Essentially, it was for the most part treated as neutral. I don’t think that anything improper was suggested in consequence of the Tribunal, was of the opinion did not deal of the question whether the changes in the makeup of the consortium could be incompatible with the ownership proposals outlined in the Esat Digifone application. 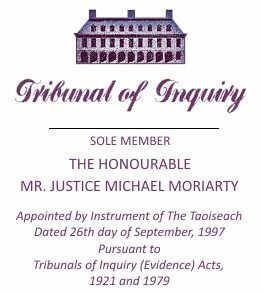 Until about, I think about 18 months ago, the Tribunal operated on the basis that not only had the opinion not addressed the questions posed by Mr. Towey in his letter of the 24th April 1996, but that those questions for whatever reason, had not been addressed in any other exchanges by either Mr. Nesbitt or by lawyers for the Attorney General â€‘ from the Attorney General’s Office. Then, for the first time, I think in late 2009, the Tribunal was informed by the Department that further information was available on this matter and the Department conveyed to the Tribunal that two officials, Mr. Brennan and Mr. Towey, had information that oral advice had been given by Mr. Richard Nesbitt, SC, concerning changes in the makeup of the Esat Digifone consortium: They themselves had in recollection of having received such advice, but sometime prior to their giving evidence, which they gave recently, they had a meeting with Mr. Nesbitt in which he had stated to them that he had in fact given such advice and that such advice had been given orally in the course of a consultation. Mr. Brennan and Mr. Towey then gave evidence. In examining Mr. Towey, counsel for the Department put it to Mr. Towey that Mr. Nesbitt had given such advice in the course of a meeting with Mr. Towey. Mr. Towey had given evidence of a number of meetings with Mr. Nesbitt but having no memory of this advice, couldn’t say when the advice had been given. Counsel for the Department â€‘ I think rather emphatically put it to Mr. Towey that it had not occurred in the course of this meeting with Mr. Nesbitt on the 23rd April. It was put to Mr. Towey that were Mr. Nesbitt called to give evidence, he would say that he had not given advice on that date, but that he had in fact given such advice on the 14th May 1996. Mr. Nesbitt then gave evidence of having given such advice on that day. Some notes were kept of each of these consultations, both of the 23rd April 1996 and the 14th May. However, in neither case, to assist the Tribunal, was there any indication that any such advice had been given and in fact, there appears to be no reference whatever to the issue even in the note of either meeting. In a further development, the Tribunal has now received information in the form of a memoranda of intended evidence of two officials of the Office of the Attorney General dealing with the matter. They have informed the Tribunal that oral advice was given by Mr. Nesbitt concerning the changes in the makeup of the Esat Digifone consortium. They have also informed the Tribunal that they themselves gave such advice. They have informed the Tribunal that awful this advice, their advice, and Mr. Nesbitt’s advice was given in the course of a consultation on the 23rd April 1996. It should be stated that I think both of the witnesses, certainly one of them, has indicated that this advice, which to his mind, was consistent with the advice given by Mr. Nesbitt in his opinion, was also given on the 14th May 1996, but I think he indicates that on that occasion it was not central to the meeting. Now, again, in examining the documents produced by the Attorney General â€‘ by the Office of the Attorney General, there appears to be no reference to any such advice. And this is the case despite the fact that from an examination of other documentation made available to the Tribunal by the Department and by the Office of the Attorney General, consultations between public servants and officials of the Attorney General’s Office or outside counsel are invariably noted and frequently noted extensively. The Tribunal is now in a position where its inquiries into the GSM2 licence until about 18 months ago or so were conducted on the basis that advice, having been requested on changes in the makeup of the consortium, no such advice appeared to have been given. It is now been asserted that notwithstanding the Tribunal’s reading of the opinion, the opinion did in fact address the question of changes in the makeup of the consortium, but more significantly, the Tribunal has now been informed, and for the first time prior to the evidence of Messrs. Brennan and Towey last year, that Mr. Nesbitt recalled giving oral advice on this question, and that this advice was given on the 14th May, 1996, that most definitively, it was not given on the 23rd April. Obtaining clarity on this issue is proving more and not less difficult, as more information comes to hand so late in the day. And in particular, the information which has now become available whereby two officials have indicated that their evidence will be that this advice was given by them and in their presence, but that the advice was given in fact on the 23rd April. Now, these advices were never drawn to the attention of the Tribunal, either by the Department or by â€‘ well, needless to say not by the Department since neither Mr. Nesbitt nor Mr. Brennan has any recollection of them, nor by any official of the Attorney General’s Office either in the course of a letter from the Attorney General’s Office relating to these matters or in a private meeting with members of the Tribunal legal team concerning the matter. The Tribunal will have to consider a number of questions arising from all this material. There is firstly the question whether the opinion can be read as having provided such advice and this is primarily a matter as you as Sole Member is equipped to form your own views. Although some of the documentation from the Attorney General’s Office may throw some additional light on this issue as well as on other issues. And there is then the question as to whether oral advice was given and as to whether, as I have already indicated, clarity can be obtained on this matter having regard to the absence of any note or other written reference concerning the same.